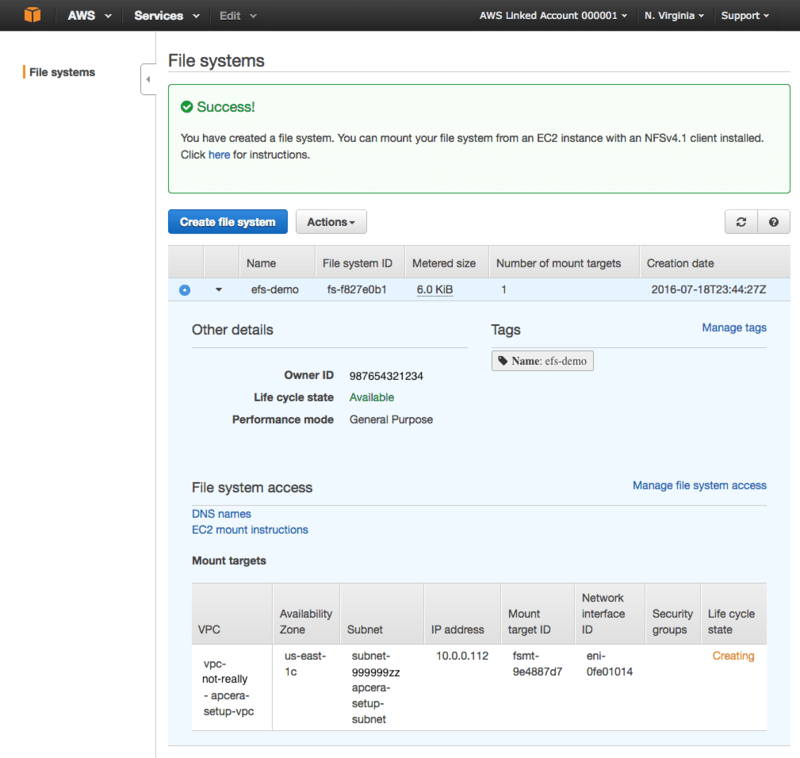 Apcera‘s NFS Service Gateway can be used to access AWS EFS storage volumes within containers. 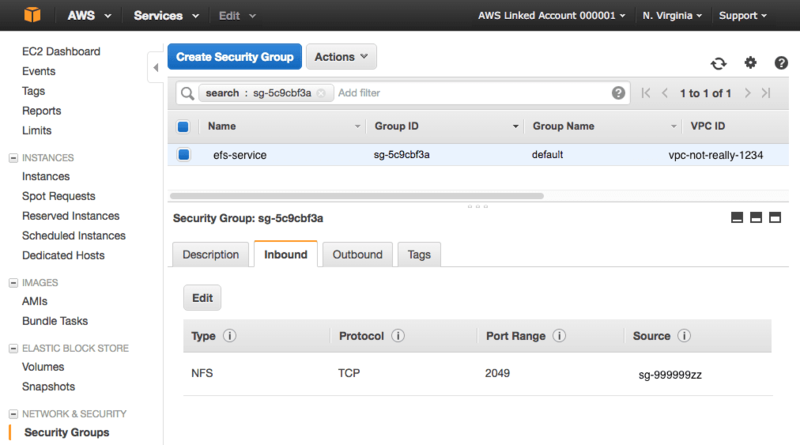 You can use EFS to provide persistent storage to your containers running on AWS-hosted clouds in regions where EFS is available. The first EFS volume you create will create a new security group. Use that security group for this and all future EFS volumes. Write down the name of the new EFS security group – we’ll configure it in the next few steps. You should see a “Success!” message and a new EFS volume with “Life Cycle State” = “Creating”. 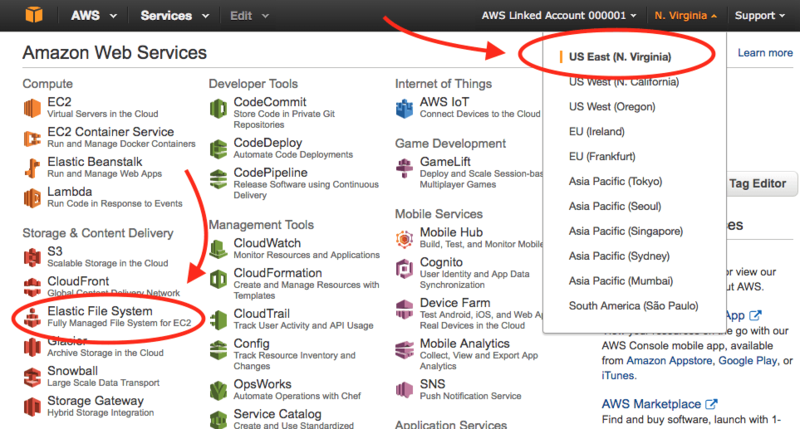 Go back to the main console menu and select EC2. Click Security Groups in the left hand nav menu. Type the name of the new EFS security group into the search filter list. On the bottom half of the screen delete the default inbound and outbound rules. This allows all VMs within your Apcera Platform security group to connect to your EFS volume on port 2049 (NFS). We’re going to create a single provider for the EFS volume. Each time you have a container or set of containers that need a persistent file system, just create a new service from the same provider. Each new service will carve out a new namespace on the EFS volume, keeping the files associated with that service separate from the files in all other services that use the same provider. According to the EFS FAQ, When you create a file system, you create endpoints in your VPC called “mount targets.” Each mount target provides an IP address and a DNS name, and you use this IP address or DNS name in your mount command. Only resources that can access a mount target can access your file system. 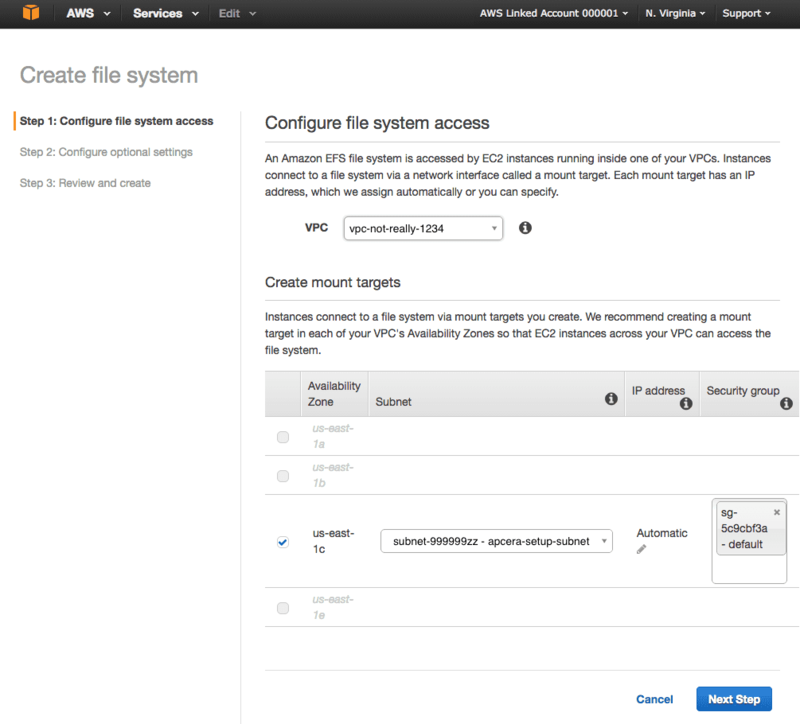 Since the Apcera Platform isn’t using Amazon DNS services internally, we’ll use the IP address to connect to the EFS volume. Now that we have a provider that can carve out EFS storage for containers, let’s try spinning up some Docker images. Include the –provider flag when you create or run the Docker job. You must include this flag if you include the –volume flag when creating or running the Docker job. Include the –ignore-volumes flag when you create or run the Docker job. I’m using the Apcera “apc” command-line tool to build the container, pulling the nginx image directly off hub.docker.com, telling it to use the awsefs EFS volume provider I created earlier for persistence, and to mount the EFS volume at the mount point “/usr/share/nginx/html”. Grepping for “/usr/share/nginx/html” shows the IP address 10.0.0.112, which is the IP of the EFS volume, the log directory name after is the unique namespace for the service, the mountpoint is “/usr/share/nginx/html”, and the mount type “nfs4”. There is no content in the directory, so I add some by echoing some HTML code to an index.html file. My container will proclaim to the world “NGINX in a Docker container on Apcera with content stored on EFS” in an H3 typeface! Now that I have some content I need to add a route to the content. Right now the NGINX container is running, and listening on ports 80 and 443, but it’s completely isolated from the outside world — no one can connect to those ports unless there’s a route (a URL) set up. 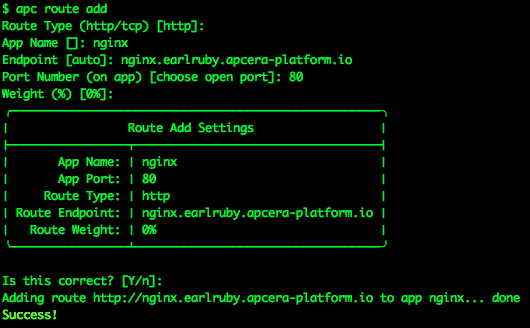 Now I’ve got 20 containers running my NGINX app, all serving up the same content, running on multiple VMs across my cluster, all load-balanced under the single URL http://nginx.earlruby.apcera-platform.io/. If any container gets killed off, the Apcera platform will spin up a new one. If any VM in the cluster dies, any containers running on it will automatically be migrated to new hosts. 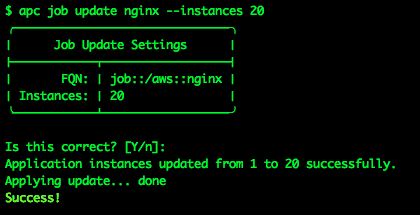 If I want to scale up the app to 100 or 1000 containers, or back down to 1, it’s a one-line command to make the change. In terms of resources, I’m using slightly less than 45 MiB to run those 20 containers. That’s not a typo — 45MiB! Containers are much more efficient users of RAM than VMs. This article originally appeared as an Apcera blog post on July 21, 2016. Word to travelers: do not book hotel rooms through TripAdvisor. They will funnel you through sketchy third-party sites (“Amoma” is the one who burned me) who advertise made-up rates, take your money, and then get back in touch two weeks later to tell you oopsie, they can’t make a reservation at that hotel after all. I guess it’s a nice scam while it lasts, but in this age of networked, instant word-of-mouth reviews, that kind of business model won’t hold up long. I suggested Shannon try installing the Web of Trust (WOT) plug-in for her browser. I use it in all of mine, and it’s stopped scam sites from being loaded into my browser. WOT displays a colored traffic light next to website links to show you which sites people trust for safe searching, surfing and shopping online: green for good, red for bad, and yellow as a warning to be cautious. The icons are shown in popular search engine results, social media, online email, shortened URL’s, and lots of other sites. The cool part is, the rating is based on the aggregate ratings of all of the people who use a plug-in. Get burned by a site? Click the WOT icon and rate the site as untrustworthy. Have an excellent experience? Click the WOT icon and rate the site as trustworthy. The more that people use it, the more accurate and reliable the ratings become. If a site is really untrustworthy, WOT will stop your browser from loading the site unless you tell it that you really want to go to that site. You can still go anywhere you want, but you’ll be warned about sites that others have had problems with. 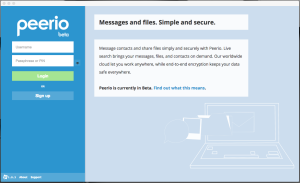 A new company called Peerio is promising secure, easy messaging and file sharing for everyone. They’re building apps that encrypt everything you send or share, making the code for these apps open source, and paying for security audits to peer-review the source code, looking for security weaknesses. They’ve put together a short video to explain the basics of what they offer. I thought I’d give it a try and see how it works. I went to Peerio.com using the Chrome browser, so the home page automatically offered to install Peerio on Chrome. 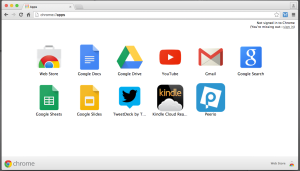 I clicked the install button and Peerio popped up as a new Chrome app. 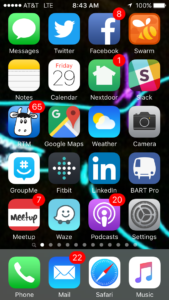 Clicking the app brought up the new account screen, with the word “beta” displayed in small type just under the company logo, so they’re letting me know up front that this is going to be a little rough. I clicked Sign Up, added a user name and email address, and was prompted for a pass phrase. I have a couple of pass phrases I use. I typed one in, but apparently it wasn’t long enough. I tried another and another. Not long enough. The words “ALMOST THERE. JUST A FEW MORE LETTERS…” appeared on screen. One phrase I typed in had 40+ letters in it, but still the words “ALMOST THERE. JUST A FEW MORE LETTERS…” persisted. Tried again, this time putting spaces between the words. Phrase accepted! Maybe the check is trying to verify the number of space-separated words, not the total number of characters? Anyhow, got past that hurdle. Next it sends you an email with a confirmation code and gives you 10 minutes (with a second by second countdown) to enter the confirmation code. I guess if you don’t enter it within 10 minutes your account is toast? Once past that step I was prompted to create a shorter PIN code that can be used to login to the site. The long pass phrase is only needed to log in the first time you use a new device, after that your PIN can be used. I tried entering a few short number sequences. All were rejected as “too weak” so I used a strong, unique password with a mix of upper and lowercase letters, numbers, and special characters. The screen hid what I was typing and only asked for the PIN once, so if I thumb-fingered it, my account was going to be rendered useless pretty quickly. Hopefully I typed what I thought I typed. 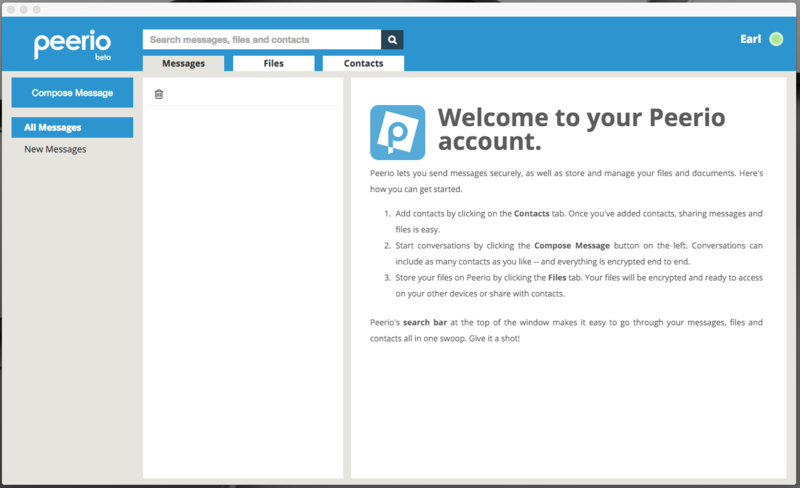 Of course to use the service to send messages to people you have to load your contacts in. 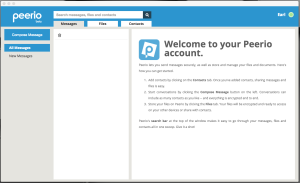 I added a friend’s email and Peerio sent him an invite. 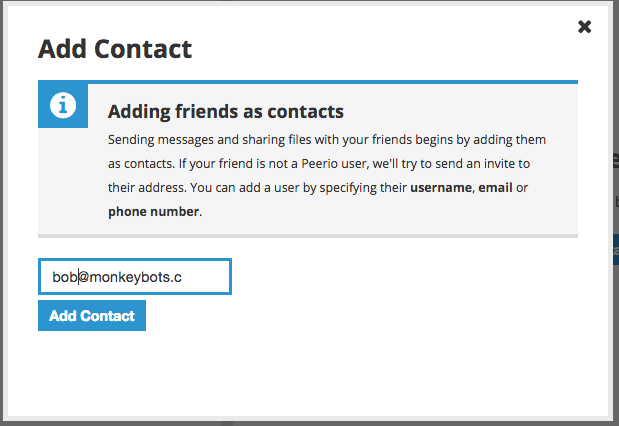 Tried adding another email address and the “Add Contact” form cut me off at the “.c” in “.com” — looks like the folks at Peerio only let you have friends with email addresses that are less than 16 characters long. 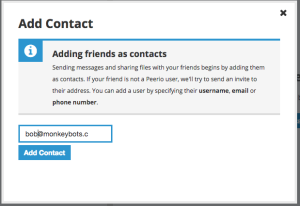 My friends at monkeybots.com, you’re out of luck. The Contacts tab has sub-tabs for “All Contacts”, “Confirmed Contacts”, and “Pending Contacts”, but the one email address I entered that was less than 16 characters long didn’t show up anywhere (I expected to see it under “Pending Contacts”). With my entries disappearing or truncated, I stopped trying to use the system. It’s an interesting idea for a service, the source code for the clients is supposed to be available on Github, but the Peerio.com site directed me to https://github.com/TeamPeerio for the source, and that link is 404. Searching Github for “Peerio” shows https://github.com/PeerioTechnologies/peerio-client and https://github.com/PeerioTechnologies/peerio-website, so it looks like this is just a case of a BETA web site with a broken link. Before the developers pay for another security audit, they really ought to try doing some basic usability testing — set up a new user in front of a laptop, and make two videos — one of the keyboard and screen and one of the user’s face, and then watch them try to log in and set up an account. I think they’d find the experience invaluable. 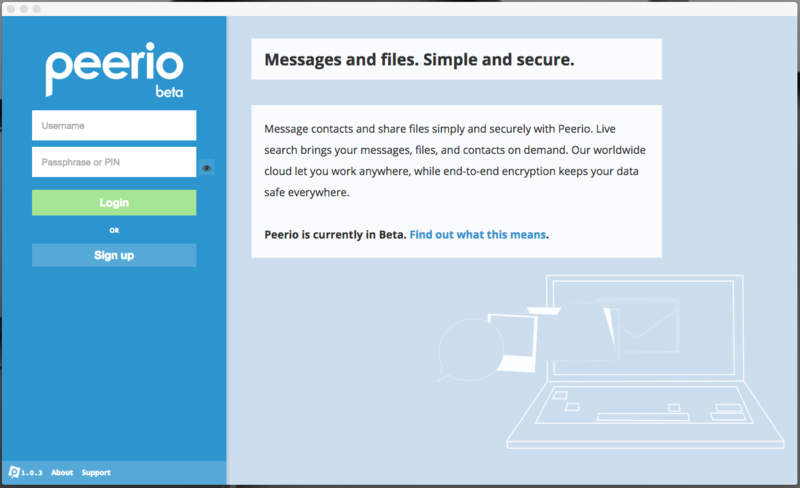 Anyhow, if you’re interested and feel like trying out their very BETA (feels like ALPHA) release, head over to Peerio.com and sign up. If you want to send me a message, you can reach me on Peerio as “earl”.